Liliya Slutsker, MD weighs a patient. 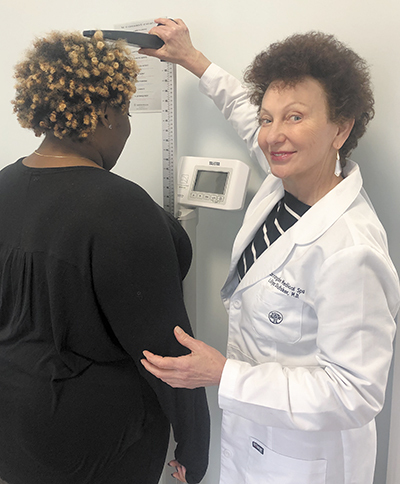 "It's not just a weight loss clinic," says Liliya Slutsker, MD, about her practice in Trussville. "I want to treat obesity." Opened a year ago, Carrington Medical Spa and Weight Loss Clinic approaches the treatment of obesity with an in-depth, medical approach. "We emphasize working with children because that's where obesity starts in the real world." Alabama is a prime location for patients fighting excessive weight issues. A third of the adult population now qualify as obese, according to the 2018 study by the Trust for America's Health and Robert Wood Johnson Foundation. A decade ago, less than one-fourth of adults rated as obese. Ten years prior to that, in 1990, the condition affected only 11 percent of adults. "When patients come to me, I ask them to fill out a questionnaire to find out their pitfalls. We want to learn what is causing them to gain weight," Slutsker says. "They may be night-eaters, sweet-eaters or have difficulties setting boundaries." Since medications can also be an influence on weight, Slutsker also assesses them. "Some antidepressants, diuretics, or oral contraceptives can change the metabolic rate and cause weight gain," she says. Then she works with the patient's primary care physician to find an alternative. Next comes blood tests to evaluate the liver and ensure the kidneys can handle a strong protein-based diet. "We also want to see if they have thyroid issues or anemia," Slutsker says. "So I'm identifying those illnesses and medications that promote weight gain. From there, we make a plan, what to eat, how to exercise, and how to change to a healthy lifestyle." Though the steps sound quick and simple, the process is not. "It's a long process and takes a lot of moral support," Slutsker says, which is why she wanted to focus on obesity in her new practice. Because today's healthcare system rarely allows primary care physicians and pediatricians to commit the time needed to assist obese patients through the needed life changes. Children, Slutsker says, especially need attention. Alabama rates tenth in the USA for children with obesity, based on 2014 data of two to four year-old WIC participants. In older children, ages 10 to 17, Alabama ranks ninth in the country with over 18 percent found to be obese. Slutsker says a child's sensitivity to their health--not just their weight--and their desire to improve it can be underestimated. "It's a very, very sensitive subject. Some kids are deeply hurt or offended when you talk about obesity or diabetes," she says. One obese 12-year-old came to her office. After the exam, Slutsky told the girl she looked good, but she was a little overweight. The girl started crying. "Because they know they're obese," she says. "And they want to be healthier. They can't run like the other children, and they get bullied about their weight, looks or inadequacies. Whether bullying leads to obesity or vice versa is unclear, but the obese child gets left alone and isolated, and the isolated get more obese." That is another reason she advocates limited cell phone, computer and TV usage, because screen time means less time in social interactions or activity in any form. She also encourages the children to hide their cell phone at night in order to get an uninterrupted minimum of seven hours. "Sleep deprivation causes more cortisol and leads to overeating," she says. For both children and adults, weekly appointments for evaluation and accountability make a notable difference. For children, though, this may be out of their hands. "A child may say they will come every week, but their parents may not be able to drive them. So they come a month later, and they weigh more than the last visit," Slutsker says. "That's discouraging for them." At the appointments, they go over their food diary, health situations, and what problems they faced during the week. And the protocol has made a difference. "Everyone who comes to this clinic is losing weight," Slutsker says. "They get off some of the meds, like blood pressure medicine, or see even a small weight loss, and that is encouraging them to continue the healthy eating. "They start to feel better, and they often think more clearly, which gives them encouragement to embrace the new habits. It becomes a virtuous cycle." With children, their weight control manifests as general happiness. "They show me their smaller size pants. They're more talkative," Slutsker says. The objective for obese patients must be more than just weight loss. "We must change their view on life," Slutsker says. "They must look for different things in food, and in social interactions and physical activities. Anybody with the right tools can get healthy."